The 2018 guided anglers may retain one Halibut up to 38 inches and shorter (which is approximately 26 lbs. & smaller), OR those 80 inches or longer (276 lbs. or bigger). 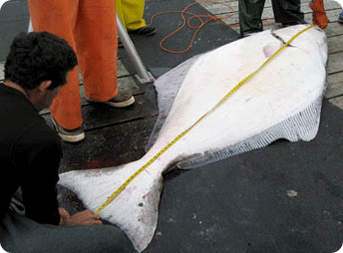 Any Halibut between 38 inches and 80 inches may not be retained. If you’re into the big beefy bottom-feeders, you are in for a treat! The ocean waters of the outer coast near Sitka are home to the legendary “barn door” Pacific Halibut. Halibut are the biggest of the flatfish species and are strong swimmers. They average about 30 pounds and 42 inches long, but in Sitka it is not uncommon to hook a halibut in the 70-100 range. The largest sport-caught halibut (without being shot with a gun) weighed in at 459 pounds and was caught in Unalaska Bay. A couple of our captains have landed larger halibut over 500 pounds. These halibut could not be entered as a sport-caught record, because they shot their fish before hauling them aboard to ensure the safety of the guests onboard. 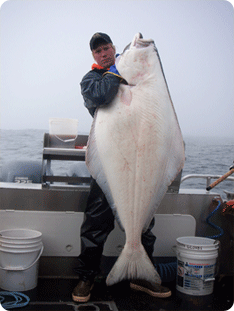 A halibut of this size can easily injure a person due to the strength and power when they move their tail. Drop-offs and deep trenches, underwater reefs, beds of kelp, and muddy, sandy, or gravel banks are the favorite hangouts for halibut. They eat a lot of different sea-life, including herring, octopus, crab, flouder, salmon, cod, and more. While they swim to various levels to catch their prey, they are usually caught at bottom-depths, which can be anywhere between 90 and 900 feet deep, depending on the area. Our experienced guides know where to find these places so you have the absolute best chance of hooking a big one. As flatfish, halibut have a dark (top) side and a light (bottom) side. This helps them hide from predators. From above, they blend in with the ocean floor. From below, they blend in with the bright sky. A mature halibut (8-12 years old) has both eyes on the dark side of its body. The light-side eye starts to migrate over in the first 6 months of life, as the young halibut drifts with the ocean currents. View halibut pictures here. 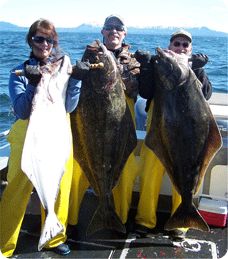 For more on halibut life-cycle and spawning, visit the ADFG website. Halibut has a delicious firm, white, nearly boneless meat. It is rich in protein and minerals and low in fat, which makes it a fabulous staple to a healthy diet. 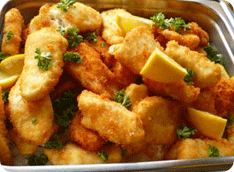 There are a variety of ways to cook halibut, including baking, frying, poaching and barbecuing. The best part is the cheeks, a sweet-flavored delicacy. For many great halibut recipes, go to Recipes page. Halibut fishing in Sitka starts getting good at the beginning of April, with peak season being from the end of May until the beginning of September. Start training now, because these big boys will surely test your strength and make you earn their delicious white flesh! "I have added one experience that every American male should have in his lifetime. 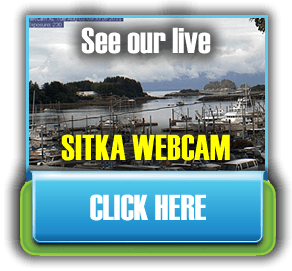 Seeing New York City; Visiting Washington DC; and fishing in Sitka, Alaska."